You can either make a booking directly on this website by using the cabin rentals tab. Or you can call our office at 479- 253-7117 and we will be glad to help you. We implement a variety of security measures to maintain the safety of your personal information when you place an order. We offer the use of a secure server. All supplied sensitive/credit information is transmitted via Secure Socket Layer (SSL) technology and then encrypted into our payment gateway provider’s database. It will only be accessible by those authorized with special rights to such systems. They are required to keep the information confidential. After a transaction, your private information (credit card information, etc.) will not be stored on our servers. We do not allow pets in any of our cabin rentals at this time. What are the benefits of renting one of your cabins? Our cabins are stocked in such a way that you always feel like you are coming "home" to your "vacation cabin" rather than returning to a small hotel room. Our cabins have full kitchens, bathrooms and covered decks. Several cabins have two bedrooms and wood burning stoves. We offer two double story cabins, which are totally private of each other, but can be combined via a secured stairwell. All cabins are perched 450’ above the White River offering a stunning view of the river and valley below. Yes. Children 14 and older are welcome! Please be advised that the cabins, and many of the common areas, have steep bluffs. We strongly recommend that all children, 16 years and younger, be accompanied by an adult. We want everyone to be safe and enjoy their stay here. Do you have access to the White River from your property? We do not have access to the river from our property. Houseman Access is a few minutes away and is actually just down the river from the cabins. This portion of the White River is good for boating and deep water fly-fishing. There are boat rentals and fishing guide services available nearby as well. Do the cabins have fireplaces? Three of our cabins, On the Rocks, Cedar Ridge and Valley View all have wood burning stoves. We only ask that you always burn hardwood species of wood in the stoves. Cedars and pines are bad news for chimneys. We provide firewood near the office. How close are you to Eureka Springs? 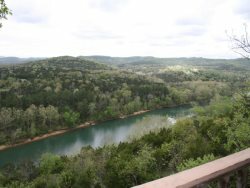 Arkansas White River Cabins is just 6 miles outside of Eureka Springs and just a few miles from 28,000 acre Beaver Lake. Branson, MO is less than a 90 minute drive. Do you have parking for trailers? Residing on an Ozark Mountain bluff has its challenges. Please let us know ahead of time if you need to park a trailer and we will be happy to accommodate you. keurig single cup and coffee pots, grill utensils, measuring cups, and a few other kitchen toys. Frequently Asked Questions | Arkansas White River Cabins - Find some of our most commonly asked questions regarding the property and cabin rentals. If you do not find an answer to your question feel free to contact us.